I have a friend named Jessica who writes this gorgeous blog, How Sweet Eats (I’m completely sure you have heard of it). She will tell you photography is not her favorite part of blogging and she will tell you she doesn’t like her photography but it is amazing. I’m writing about her because 1. she is amazing 2. her gorgeous cookbook Seriously Delish hit bookstores this week! Eeeee, so exciting! I’m completely excited and so proud of her! The recipes are amazing, I bookmarked like 20+ recipes that I want to make. And her stories are funny and hilarious…just like her blog, how she writes and just like she is in person. Through blogging, I have been fortunate to make some amazing friends and Jess is one of these people. Super sweet, authentic (she’s as real as they get, I swear), exactly as she is online (on social media and her blog) she is in person, caring and hilarious! She’s on her book tour right now, here are the details and the first one was in Tampa, FL…which is about 2 hours from me. I made the trek over earlier this week because it had been two long years since I have seen Jess in person! It was so fun and the folks over at Inkwood Books are amazing. 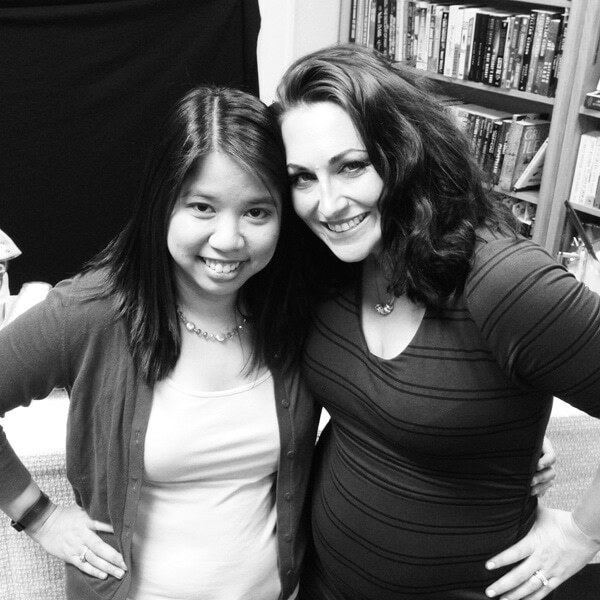 I loved all of the funny stories Jessica told the crowd and so glad I was able to attend her book signing! 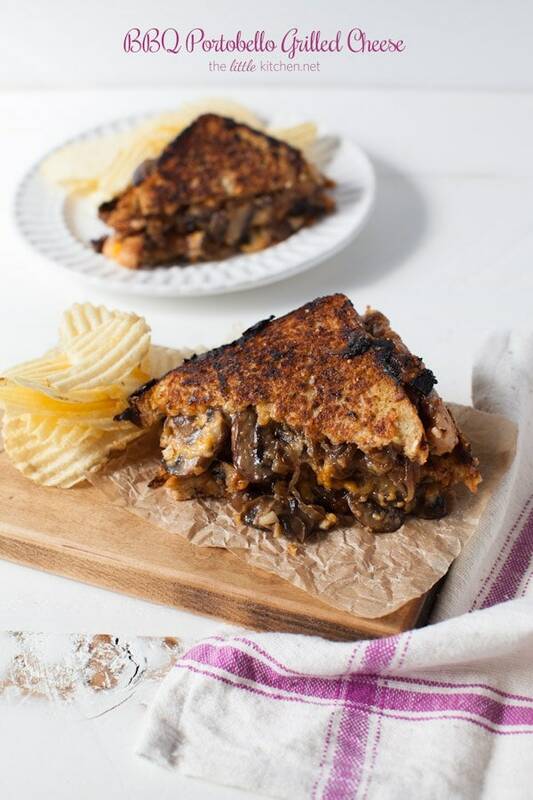 One of the first recipes that caught my when I first flipped through her cookbook was her BBQ Portobello Grilled Cheese with Caramelized Onions. 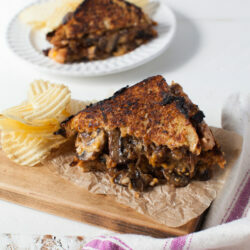 Caramelized Onions and mushrooms and cheese and bread…done and done. I’m a huge fan of easy recipes and this cookbook is full of them…all of them take 24-45 minutes, super easy and convenient. never too much cheese. never. my favorite part of grilled cheeses is the cheese that cooks in the bottom of the pan! And done and amazing. 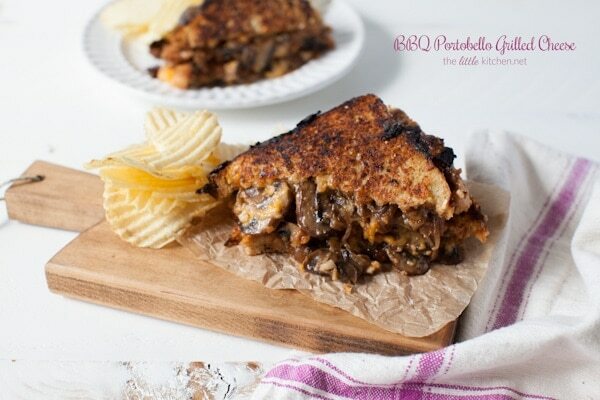 I used baby bella mushrooms because the portobellos at my store didn’t look too hot. I will be so annoying if I keep going on and on about how much I loved these grilled cheeses! Make them today! 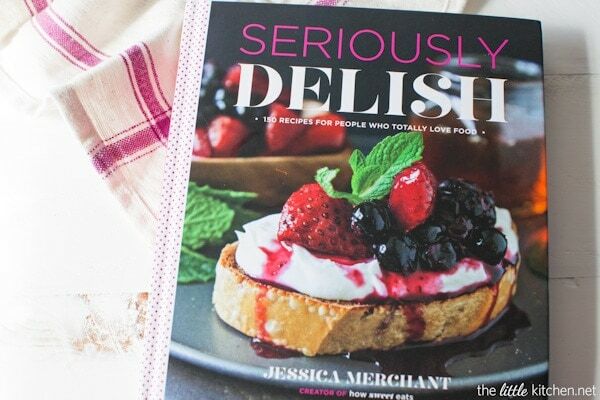 And check out the cookbook giveaway — 2 copies from me! Heat a large skillet over low heat and add 1 Tablespoon of the oil. 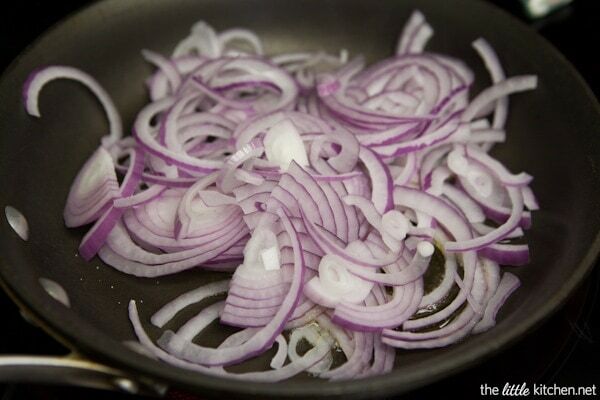 Add the onions with the pinch of salt and stir them to coat. 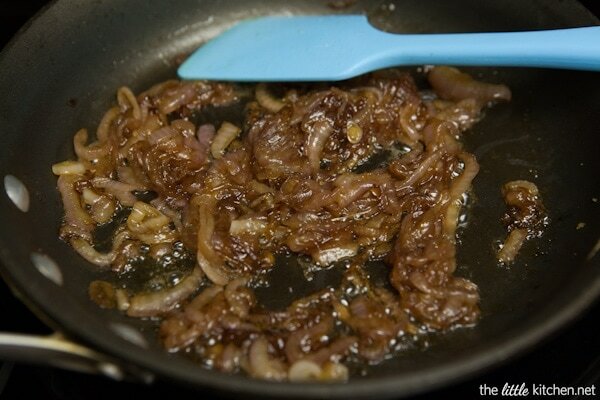 Cover the skillet and cook the onions until softened and slightly golden, about 15 minutes, stirring every few minutes. Add the brown sugar and stir to combine, then over and cook for 5 minutes more. Add 1/2 Tablespoon of the oil to the skillet and add the mushrooms. 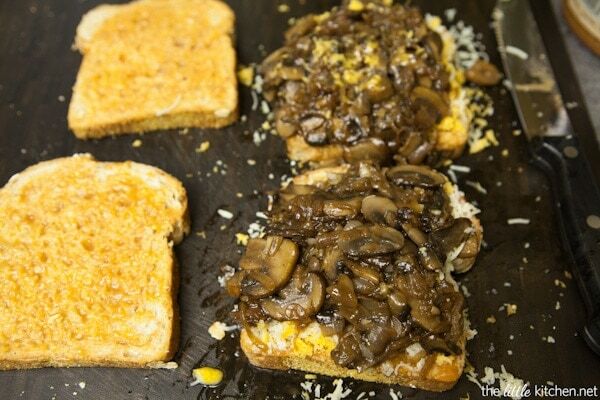 Cover the skillet and cook the mushrooms, tossing once or twice, for 8 to 10 minutes. Stir in the garlic and cook for 30 seconds. 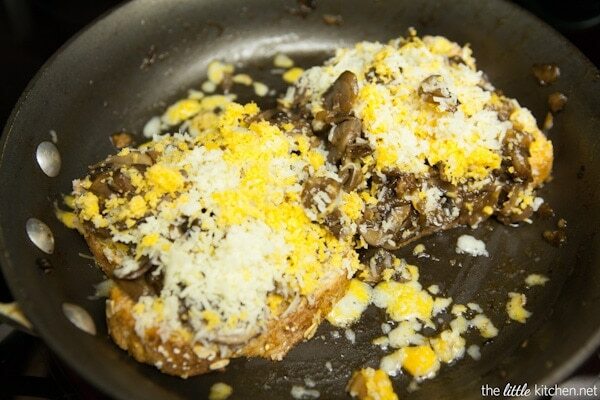 Remove the mushrooms and garlic from the skillet, placing them on a plate. Keep the same skillet hot over medium-low heat. To assemble the grilled cheese, brush the outside of each bread slice with the remaining 1 1/2 Tablespoons olive oil. Liberally spread the BBQ sauce on the inside of each bread slice. 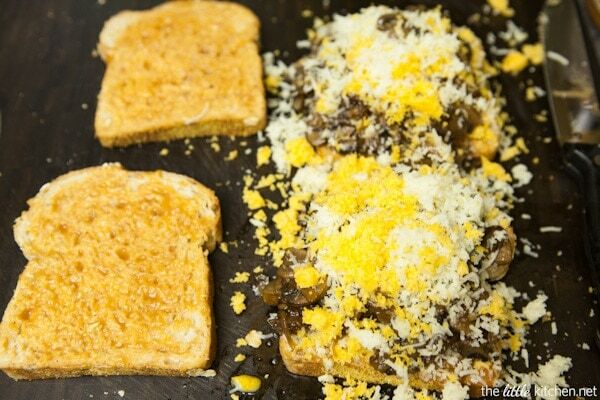 Evenly layer the cheese, onions, and mushroom slices on the bottom pieces of bread and top them with another handful of cheese. Add the top slices of bread. Cook the sandwiches until golden brown on each side, 4 to 5 minutes. Disclosure: I received a review copy from the publisher but it doesn’t matter, I would have and did buy copies myself! There are affiliate links in this post.